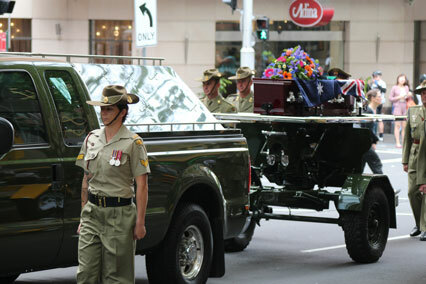 With the coffin borne on a gun carriage, a packed St Andrew's Cathedral has farewelled Bishop Ken Short. Bishop Short, described by Archbishop Davies as an 'elder statesman' of the Sydney Diocese, died on October 19th after suffering a stroke. Family as well as friends and colleagues from his varied ministry as CMS missionary in Africa, through parish ministry at Vaucluse and as Dean of Sydney, as well as his roles as Bishop of Wollongong and Parramatta, gathered in St Andrew's Cathedral. 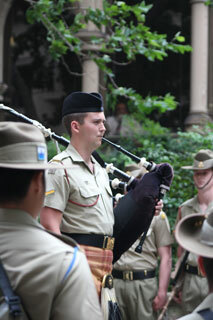 But it was his service as a soldier during the occupation of Japan and as first Bishop of the Defence Force, which meant the service proceeded with full military honours. 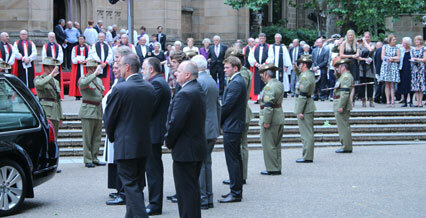 An honour guard lined the Bathurst St steps as the coffin was taken into the Cathedral. The procession was watched by his widow Gloria and family as well as Archbishop Davies, former Archbishop Harry Goodhew and Canon David Short, Bishop Short's son. His son-in-law the Rev Simon Manchester delivered the eulogy and his daughters Kathy and Marion read bible passages. Mr Manchester spoke of the late bishop's varied roles, "He had a gift for teaching the bible simply and strongly. In his official capacities he travelled all over the world. In Christ's service he was able to visit about 30 countries. He would faithfully explain and apply scripture with wonderful illustrations and he was invited to speak for his skill and ability. Only heaven will reveal how many people were transformed from that wonderful ministry." Canon David Short preached the sermon on the picture Revelation 21 paints of heaven, at times using his father's notes on the same passage. "Heaven is not just a very long church service, no matter now good it is. All that's best in creation gravitates there." Canon Short told the congregation. "It's a place of art and culture, nothing of value will be lost. All the threads of goodness that God has woven into our world - not one thread will be missing."